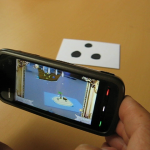 Cambridge-based Augmented Reality specialists Optricks Media have just released their newest creation: AR! Pirates. It’s a swashbuckling shoot-em-up game for Symbian devices (Nokia, Samsung, Sony Ericsson) that uses a really unique marker-based mechanic: the coins in your pocket! In AR mode, three coins laid out in a triangle become a desert island, and the surface they are on become the ocean. The idea is to stop waves of marauding pirates from stealing your buried treasure, so you must aim your device to blast the approaching galleons with your cannon, whilst avoiding their fire by moving (yes, moving!) out of harm’s way. The more ships you sink, the more treasure you earn and the more power-ups you unlock. There are 30 levels in all, including battles with the Spanish Armada, drunken pirates and ghost ships. It costs 99p to download the full version, chargeable to your phone bill. Here’s a video of the game in action! As you’ve seen, the innovative approach that Optricks have taken with their markers mean it’s possible to play at any scale. You could use coins to keep the game small enough to play in the pub, or you could ‘upscale’ and use larger discs (like frisbees) to play with massive pirate ships. The best bit: the larger the markers, the larger the field of play, and the more immersive the player experience! This is one of the best, most purposeful uses of AR that I’ve seen. There are too many use-cases where ‘the medium is the message’ – but in this instance the medium is what connects you to the content, rather than defines your experience of it. Great work Ian, Gavin, Marcus and Dylan. Here’s the link again: AR! Pirates. Posted on July 14, 2010 May 31, 2011 Author Tom SaunterCategories Gaming, MobileTags augmented reality, cambridge, development, Gaming, innovation, MobileLeave a comment on ARRR! Augmented Reality Pirates!